← Notes from a small island. My first day back on Hercules was tough, really tough. 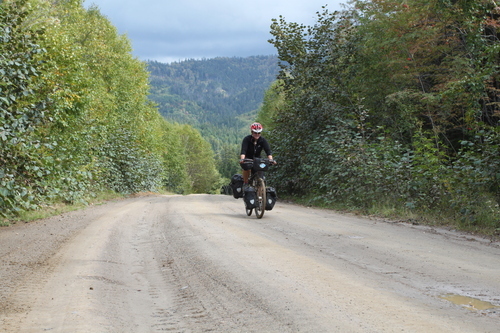 Steep hills, gravel, grit, bridges with holes in and a lot of thick mud. A few close calls with sliding wheels and skids, but thankfully no harm done to either of us that won’t wash off. It wasn’t rapid, but I am assured the roads ahead are better. Big thanks to Alex Yemchenko and his wife Julia for their support on Sakhalin , Greg Baliakov for his advice on the kayaking, and to Rob Thompson for his efforts to smooth our way in Japan. PS Three days to Yuzhno Sakhalinsk from here, the capital of the island, down on the South coast. PPS Tim is in the capital preparing for the leg to Japan (fraught with regulations and complicated logistics) and Justine is heading South to join him. PPPS Meanwhile in the UK at L2L HQ, Gulliver (my rowing boat) is being fitted out with various bits of kit and Mum is busy with a shopping list for seven months at sea. Thanks Team. Those roads look almost Oregon-esque. bet you can’t wait to ride down the Ginza? Looks a bit messy there Sarah. Hercules looks a bit ofa mess but he will be OK after a goodwash down. Hope the tracks and roads get a lot better for you. Look forward to your next blog God Bless.Peter Nottingham. Looking pretty muddy there, but looks like Hercules is managing admirably in the mud. Spent Sunday in Rutland visiting a friend, as he and my partner took on the Wiggle Rut cycle ride. Enjoyed a nice trip down to Rutland water and it made me think of you, half way across the world. 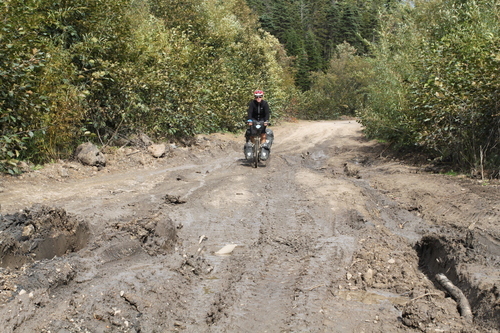 Looks more like a mudslide than a road…..makes me think of the song Slip Sliding Away by Paul Simon! Well I see that it is going so well that you felt you had time for a luxurious mud bath spa threatment,…for you AND Hercules. Some people just have it easy. Sheesh! WELL, I did see it, and all the MUD and potholes!!!!! Glad I don’t have to do your washing at the moment……..actually , do you manege to get it done??????? I am always amazed at just what great lengths you will go to get a swim in an ocean, or to see the country side, and to play in the dirt and mud. This is ‘pure’ adventure…! Does the smell of the ocean spur you on? 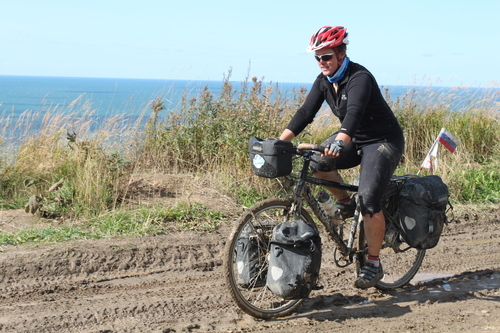 Interesting scenery, keep pedalling! and avoid those potholes. Been away for a few days so have now caught up on your wonderful reports. You have certainly been through it. Hope that you have a bit of an easier time now and that you get to Japan safley. We are all behind you following you all the way. Please take great care and happy pedalling for now.